This is the second blog post in a 2-part series looking at design challenges for Wi-Fi front-end designs. Part 1 covered thermal considerations. There are any number of strategies that consumers can try to fix interference problems with Wi-Fi in their homes — moving the router, reconnecting the device to their Wi-Fi network, power cycling the modem … and calling their service provider when nothing works and they don’t know what else to try. But as an RF engineer, how can you design a Wi-Fi access point that addresses the biggest interference issues from the outset? Many of these standards can interfere with each other, leading to connectivity problems for users. And then there’s unlicensed spectrum to contend with. Licensed and unlicensed networks are becoming more important factors as constrained wireless communications offload data to continually expand capacity. Also, the new Internet of Things (IoT) realm draws heavily on this unlicensed spectrum. The challenge is to keep all these licensed and unlicensed bands and multiple protocols working in conjunction with each other without interference difficulties. Interference can occur within a device or between devices, including between wireless carrier signals or between wireless standards. The most common interference scenario is Bluetooth and LTE with Wi-Fi because these technologies are so widespread. Let's look at some of these in more detail. Desensitization is a degradation of the sensitivity of the receiver due to external noise sources, and results in dropped or interrupted wireless connections. It isn't a new problem — early radios encountered receiver sensitivity when other components became active — but now it’s particularly troublesome for today’s wireless technologies, including smartphones, Wi-Fi routers, Bluetooth speakers and other devices. Two radio systems occupy bordering frequencies, and carrier leakage occurs. The harmonics of one transmitter fall on the carrier frequencies used by another system. Two radio systems share the same frequencies. LTE and Wi-Fi: As shown in the below figure, several LTE bands — Bands 40, 7 and 41 — are very close to the Wi-Fi band channels. Leakage into the adjacent Wi-Fi radio band is very probable at both the high and low end of the 2.4 GHz band. Without proper system design, the cellular and Wi-Fi channels 1 and 11 can interfere with each other's transmissions and receive capability. 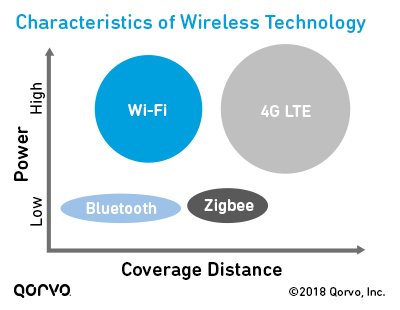 Bluetooth and Wi-Fi: Bluetooth and Wi-Fi transmit in different ways using differing protocols, but they operate in the same frequency ranges, as shown in the following figure. As a result, when Wi-Fi operates in the 2.4 GHz band, Wi-Fi and Bluetooth transmissions can interfere with each other. Because Bluetooth and Wi-Fi radios often operate in the same physical area (such as inside an access point), interference between these two standards can impact the performance and reliability of both wireless interfaces. One way federal governments have tried to help consumers is by regulating the emissions and spectrum of many electronic devices and requiring consumer products to undergo compliance testing. In the United States, the Federal Communications Commission (FCC) requires that most RF devices undergo testing to demonstrate compliance to FCC rules. They enforce strict band edges by requiring steep skirts on the lower and upper Wi-Fi frequencies, to help with coexistence with neighboring spectrum. Back off the power level on Wi-Fi channel 1 and 11, because they're at the edge of the Wi-Fi spectrum. Use filters with very steep band edges. 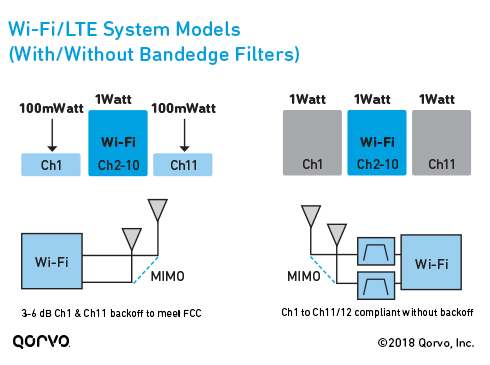 Our approach is to use high-performance coexistence and bandedge filters, to allow Wi-Fi transmitters to operate close to the upper and lower FCC band edges. These filters address the stringent thermal challenges of multi-user multiple-input/multiple-output (MU-MIMO) systems, without compromising harmonic compliance and emissions performance. This is critical to achieving reliable coverage across the full allocated spectrum. But why do high-Q BAW filters make such a difference for FCC band edges? As you move into higher bandwidths like Wi-Fi, surface acoustic wave (SAW) devices can suffer from higher insertion losses than BAW due to radiation of acoustic energy into the bulk of the substrate. As shown in the following figure, as you move up (to the right) in frequency, you can see high-Q BAW is a good option for filter designs due to this bulk radiation loss effect. Also, BAW maintains the steep skirts required for FCC band edges; SAW can’t meet the performance requirements at these higher frequencies. BAW also has better temperature stability than other technologies, which gives it an advantage during FCC certification tests. Most Wi-Fi designs are created at room temperature (20-25°C) on a bench, but the system in its application environment can actually operate around 60-80°C. Insertion loss increases as temperature increases, and failing to estimate for this can cause issues during product certification. Using BAW reduces the shifts in insertion loss and makes certification test results more predictable. Learn more about BAW versus SAW in our free e-book, RF Filter Technologies For Dummies® (Volume 1). As shown in the following figure, the bandedge response is better using a filter than without it, and it allows designers to push the limit on RF front-end output power while meeting the FCC requirement for power spectral density. This means bandedge BAW filtering allows operators and manufacturers to deliver high-speed data and greater bandwidth by using spectrum that might be lost with no filtering. Wi-Fi designers normally must set the entire unit power to whatever the lowest bandedge-compliant power is for all channels. So, if the compliant channel at channel 1 is 15 dBm but channel 6 can achieve 23 dBm, the designer settles the entire power control scheme to 15 dBm. Using bandedge filtering allows designers to set the power scheme to much higher powers, thus making it possible to use fewer RF chains to achieve their goals. BAW bandedge filters can also exhibit power handling capabilities for transmitting up to 28 dBm. This can improve system performance by greater than 15 percent and enable 5G multi-MIMO with less co-channel interference. 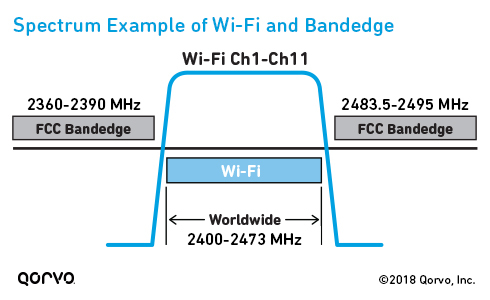 CPE developers who don’t use bandedge filtering have difficulty meeting FCC requirements on Wi-Fi band channels 1 and 11. In contrast, when high-Q BAW bandedge filters are used, it allows the CPE designer to keep the power level the same throughout all the channels (1 – 11). Without bandedge filters: Let’s assume you’re in a house with several individuals using Wi-Fi and mobile phones. You’re on Wi-Fi using channel 5, streaming a football game and experiencing no buffering or interruption. But then new mobile users arrive in the house and begin to take over your channel 5 Wi-Fi space. The CPE unit adjusts and bounces you to channel 1 to free up more space on channel 5. If the Wi-Fi unit doesn't have bandedge filters (as in the block diagram on the left), your Wi-Fi strength and streaming degrade to the point where buffering occurs. Why? Because to meet the FCC requirement, the CPE unit must back off its power in channel 1 so it doesn't interfere with adjacent cellular bands. With bandedge filters: However, if the CPE unit had been designed with bandedge filters (as shown in the block diagram on the right), channel 1 and 11 would not be compromised and the power level would not require backoff. You can watch your streamed football game without any buffering. In a connected world with more and more devices and wireless standards, coexistence and interference issues will not go away. To make use of every bit of spectrum available, Wi-Fi designs with high-Q BAW filters can improve the performance of Wi-Fi access points.